This entry was posted on Monday, June 23rd, 2014 at 11:46 am and is filed under bars, business, business as usual, couples, dating, essays, fish, food, friends, memoir, relationships, short story, writing. You can follow any responses to this entry through the RSS 2.0 feed. You can leave a response, or trackback from your own site. I ate at the Mt. Vernon many times, although I must admit that my fading memories have begun confusing it with “Gampy’s” (The Great American Melting Pot) right up the street. Gampy’s was more “in” after a while with the late night theater people (that was where I first saw/met then local ‘weather-girl’, Oprah Winfrey after a show). But your memoir brought me right back to the Mt. Vernon when you mentioned the mirrors, and the very nice waitresses . . . and the coats all piled up. 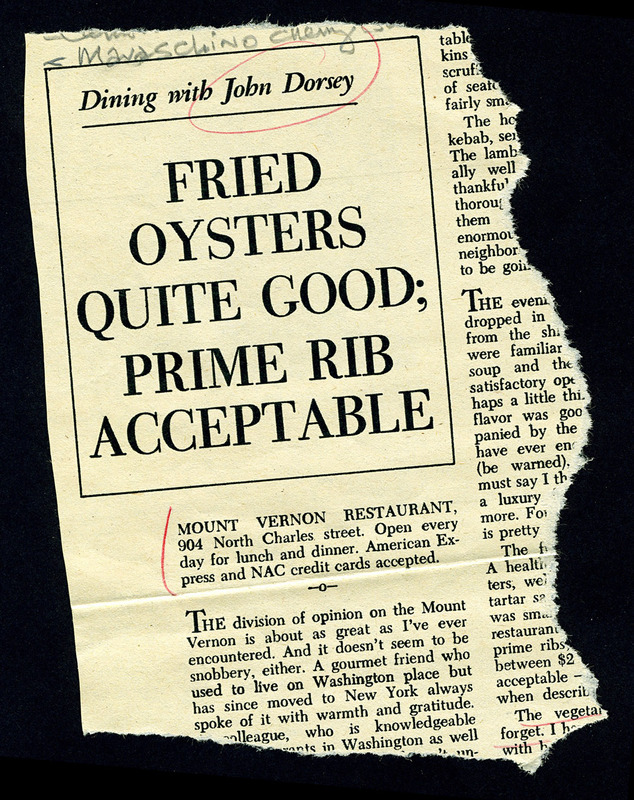 I also remember the fried oysters very well, but never had the rockfish. On the other hand, I WOULD have finished off your potatoes. Thanks for your comment, Jacquie. I thought you’d have something interesting to say on the subject, and as usual you’ve come through. If MY memory serves, “Gampy’s” took over the Mt. Vernon’s building after the Mt. Vernon moved directly across the street into a two-level space. Perhaps some other theater “regular” at both places can nail down the location and name sequences. I remember the Mt. Vernon being on the east side of Charles, but then I’m a new-comer to Charm City, here only since fall of ’69 . . . I do remember when it became Gampy’s (or I’m as confused as Jacquie about when that happened). I remember the dark booths, and the coat hooks, and I always enjoyed eating there. I’m surprised that Marie Louise is where the original Mt. Vernon Restaurant was. It’s a fun place, but not comfortable in that old-fashioned “down home Baltimore, albeit with just ‘ok’ food” way that the MVR was. Thanks for your comment, Jo-Ann. (BTW, I don’t consider anyone who has lived in Baltimore over 40 years a “new-comer.”) During the 1970s, when I spent my prime time at the Mt. Vernon, the restaurant was on the WEST side of Charles (on your left going north). Then, sometime in the 80s, it moved to the EAST side and the building it vacated became The Great American Melting Pot, aka “Gampy’s.” I guess it’s possible that some of the confusion may be caused by the dual-name tags . . .
Ok, now it’s all falling into place. I was at that Gampy’s a few times. 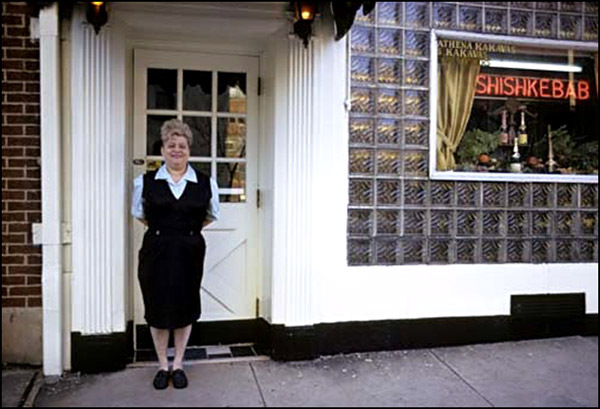 The poet Dyane Fancey, who recently passed away, was a waitress there and had been a student of mine at Towson U. — RIP, Dyane.